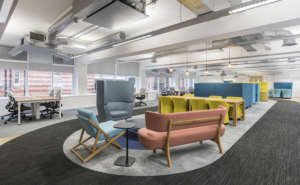 Goodyear Dunlop's new office makes tracks towards a collaborative and connected future. 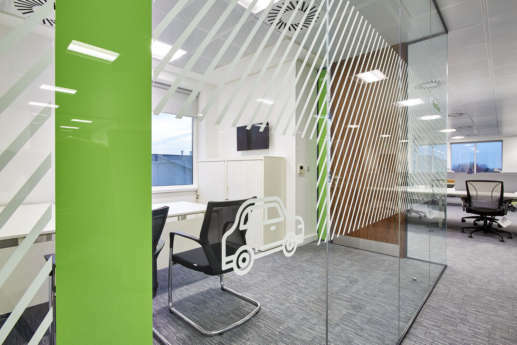 The new office has been designed to house the firm’s five brands – Goodyear, Dunlop, Fulda, Sava and HiQ. 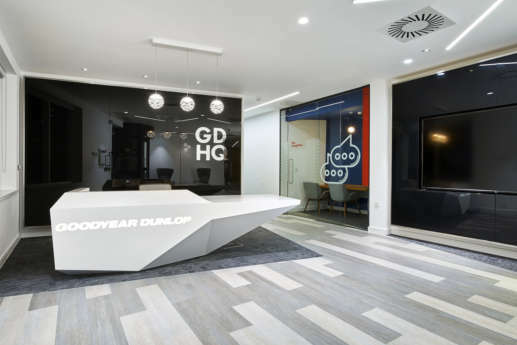 Bringing all their brands under the one roof will allow Goodyear to reaffirm their position as a creative and innovative sales, marketing and R&D organisation. 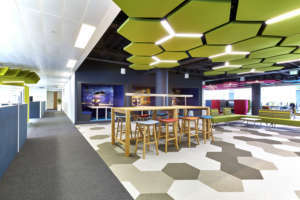 Goodyear wanted to showcase their industry knowledge and technological innovation, while providing inspirational and flexible working spaces for each of their brand's unique requirements. 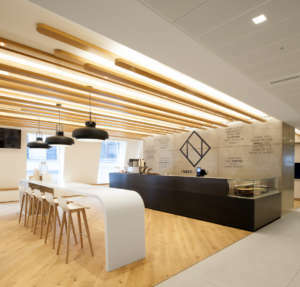 Upon entering the office, visitors are greeted with a striking and contemporary reception space, and a large format digital display representing each of the five brands. 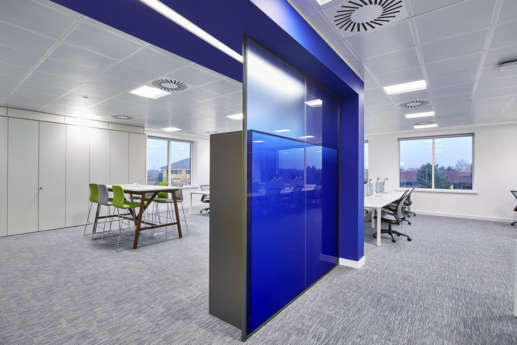 The walls are glazed and illuminated in a monochromatic colour scheme, which contrasts with the bright colour accents used on the working floors. 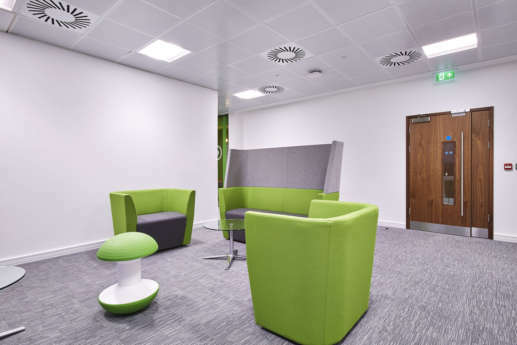 Each area of the fit out has its own key colour accent that's used on both the walls, meeting room details and feature furniture; giving an individual identity to each floor. 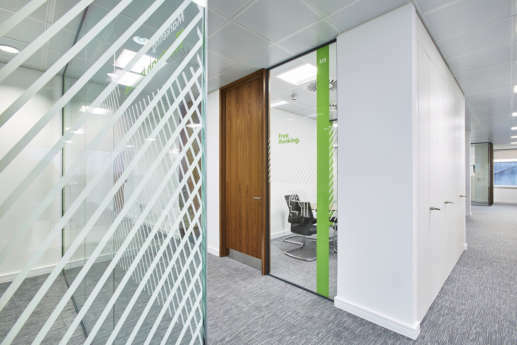 Colourful icons and graphic detailing are used on the glass meeting room exteriors to provide a bold, modern look to the fit out. 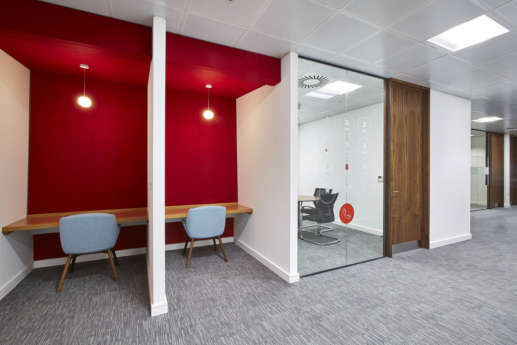 We’ve used a mix of bright primary colours, alongside large format icons to give personality to each meeting space. 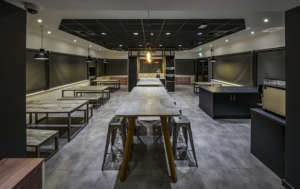 They’ve also been used to highlight the unique purpose of each of the spaces. 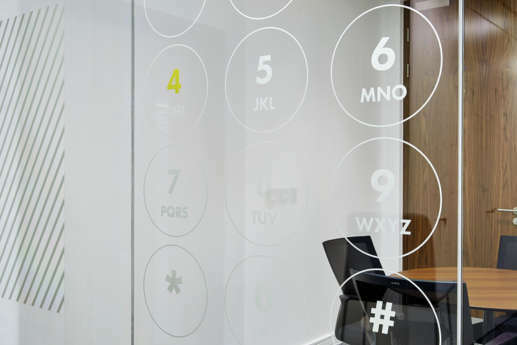 The small meeting rooms, designed for private calls have an oversized phone dial pad graphic on the glass, while larger meeting rooms have been treated with coloured graphics and icons to provide both character and privacy to the spaces. 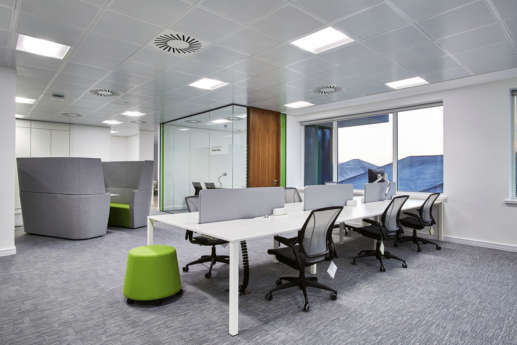 Meeting spaces have been designed to promote collaboration, efficiency and innovation. 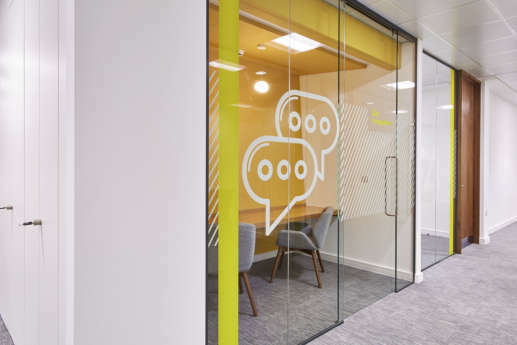 Individual floors have AV and VC enabled private meeting facilities, one-to-one booths, telephone rooms and freestyle collaboration hubs with flexible furniture and whiteboard walls. 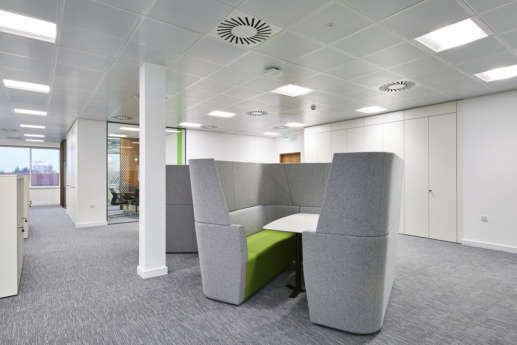 These spaces get staff up and about, selecting facilities and environments to suit each daily task - encouraging movement, efficiency and collaboration. 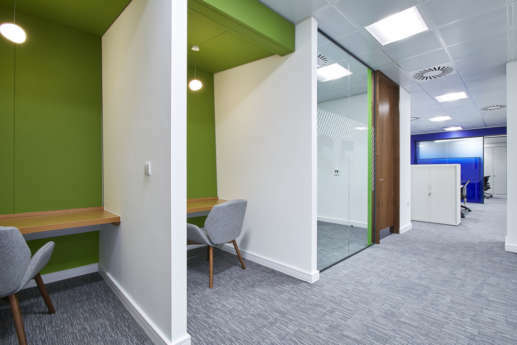 To optimise the floorspace, we designed meeting rooms for particular tasks, which avoids having one or two people book a large meeting room for a small catchup. These include solo concentration rooms, calling booths, and two, four and eight-plus person meeting rooms. 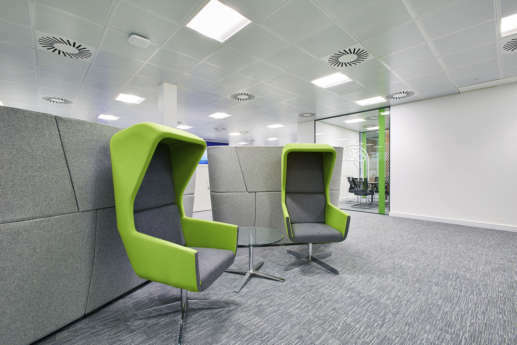 This ensures that staff always have an environment available to support their meeting or working style. 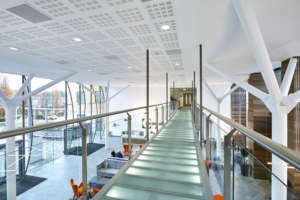 Each floor has its own refreshment facility, with the ground floor having a much larger dining and social hub. 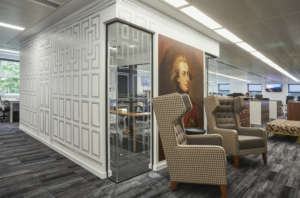 This provides somewhere for staff to come together for company-wide meetings and social events. 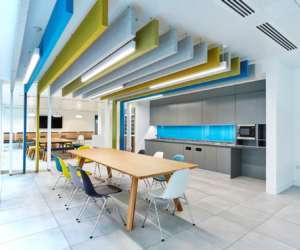 From this ground floor hub, staff can access a wellbeing space for a spot of ping pong, or rest and relaxation as the mood suits. 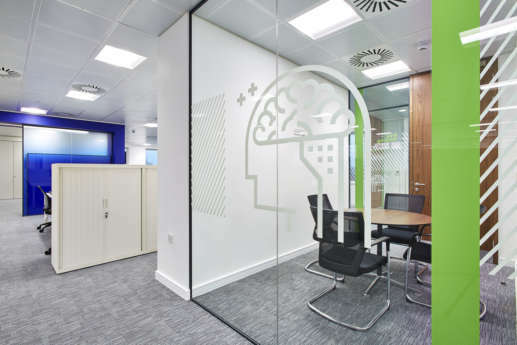 The icon theme introduced in the meeting rooms is carried on through to the staff cafeteria where we’ve playfully used iconography to boost staff engagement. 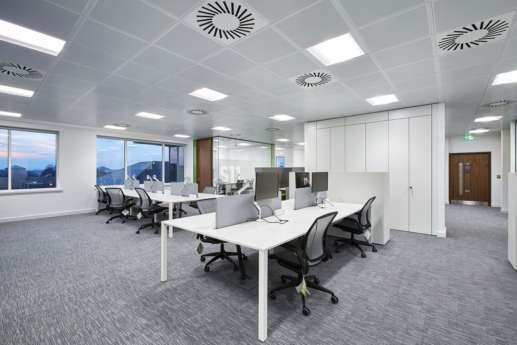 The business suite and meeting spaces across the fit out are all bookable via a digital facilities management system, in order to increase space utilisation. 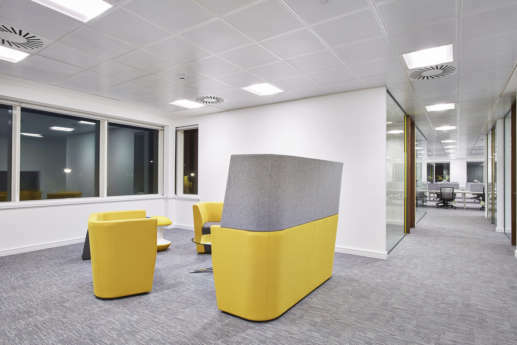 The fit out is centred around enabling technology, including AV enabled collaboration benches and a dynamic mood lighting system that can adapt its colour to the season, or the brand of visiting clients. 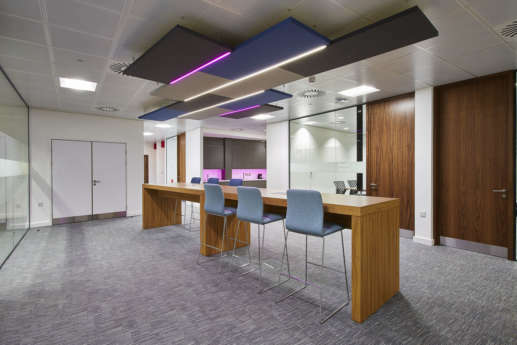 We also installed matching mood lighting in the staff kitchen and tea point, which is complemented by a suspended ceiling light feature above an activity-based working area.